for a product collection developed by André Renoux before his passing in 2002. 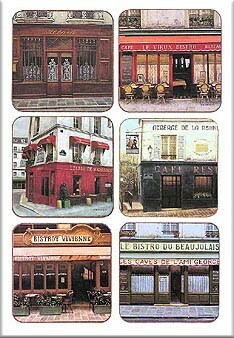 Bistros of Paris by André Renoux. Easy to clean. Heat resistant. Stain and scuff resistant. Unique silky finish. Completely sealed edges. Hardboard protective cork base. A few sets of Coasters still available! view a larger image of the placemats. setting your table with them! Renoux's early canvases explored streetscapes and the legendary Montmartre. It was not long before he had fallen under the spell of the City of Light. Renoux's vibrant passion has enabled him to paint the very essence of Parisian life. With an affectionate eye for bistros, cafes, squares and shop fronts, Renoux invites you to experience the Paris he cherishes so deeply in his heart and to be his companion in nostalgia. view a larger image of the coasters.